Students were asked after each nutrition lecture to rate the effectiveness of the task. A high percentage of the students agreed the lectures were beneficial. Since the 1985 report titled “Nutrition Education in U.S. Medical Schools,” The National Research Council has recommended at least 25 to 30 hours of nutrition education in graduate medical education.1 However, a 2013 survey of 133 US medical schools found that 71% of programs continue to fall short in providing the minimum recommended 25 hours of nutrition education.2 Poor or inadequate nutrition is the root cause of many common diseases and exacerbates the disease progression of many acute and chronic ailments. Studies correlate the role of nutrition in the prevention and treatment of cognitive impairment and epilepsy.2 In fact, as many as one third of all cancer diagnoses are related to nutritional factors.3, 4 Evidence suggests that with growing attention to the importance of nutrition in the treatment of chronic diseases, the variety of problems for which patients are referred to dieticians is increasing.5 Without adequate training in the basic tenets of nutrition and the skills needed to provide effective nutrition counseling to patients, graduates of medical schools are ill equipped to assist their patients in making necessary lifestyle changes. As the United States continues to face increasing rates of chronic diseases directly related to poor nutrition, it has become critical to address the lack of evidence-based, practical nutrition education. We approached this problem at Wake Forest School of Medicine by creating a student-led nutrition lecture series with the aim of instituting a sustainable nutrition education model. A total of five 1-hour evidence-based lectures were created by students along with a faculty mentor, and surveys were conducted before and after the lectures to assess feedback. On the basis of survey data from Wake Forest School of Medicine, 85% of the 65 participating students in their clinical years of education are not confident in their preparedness to counsel patients about nutrition topics. Likewise, the majority of respondents (86%) stated they would be interested in more practical evidence-based nutrition education (Appendix). Additional survey data collected after each of the 5 peer taught lectures were overwhelmingly positive. Students agreed that each lecture expanded their knowledge, that they would be able to use this information to counsel patients, and that the material was taught to their educational level (Figure 1). On the basis of these results, it seems the peer-taught lecture series may be an effective model for addressing the current academic deficit in nutrition education. Furthermore, the postparticipation survey data endorsed that peer teaching of evidence-based nutrition education is an effective way to expand medical students’ current level of knowledge and prepare them to counsel patients. 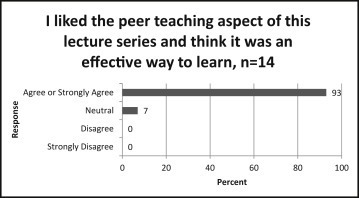 A total of 93% of students surveyed agreed with the statement: “I like the peer teaching aspect of this lecture series and think it is an effective way to learn” (Figure 2). This article originally appeared in the June 2017 issue of The American Journal of Medicine.